Shimansky has a cool collectible for all you soccer fans out there. The jewelry company based in South Africa, created a one of a kind diamond encrusted soccer ball made with flawless South African diamonds. 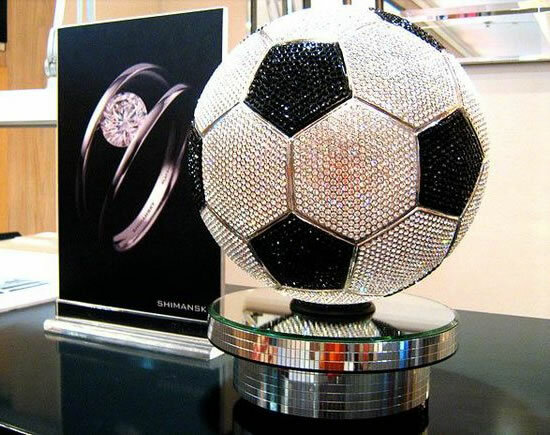 The unique soccer ball is a real life-size model made of 6,620 white diamonds and 2,640 black diamonds totaling to a mighty 3,500 carats. The soccer ball took nearly three months to make and is estimated to hold a value of $2.59 million. Chief executive Yair Shimansky will unveil the soccer ball at this year’s FIFA World Cup in South Africa.